This protocol describes a scalpel loading-fluorescent dye transfer technique that measures intercellular communication through gap junction channels. Gap junctional intercellular communication is a major cellular process by which tissue homeostasis is maintained and disruption of this cell signaling has adverse health effects. Upham, B. L., Sovadinová, I., Babica, P. Gap Junctional Intercellular Communication: A Functional Biomarker to Assess Adverse Effects of Toxicants and Toxins, and Health Benefits of Natural Products. J. Vis. Exp. (118), e54281, doi:10.3791/54281 (2016). This protocol describes a scalpel loading-fluorescent dye transfer (SL-DT) technique that measures intercellular communication through gap junction channels, which is a major intercellular process by which tissue homeostasis is maintained. Interruption of gap junctional intercellular communication (GJIC) by toxicants, toxins, drugs, etc. has been linked to numerous adverse health effects. Many genetic-based human diseases have been linked to mutations in gap junction genes. The SL-DT technique is a simple functional assay for the simultaneous assessment of GJIC in a large population of cells. The assay involves pre-loading cells with a fluorescent dye by briefly perturbing the cell membrane with a scalpel blade through a population of cells. The fluorescent dye is then allowed to traverse through gap junction channels to neighboring cells for a designated time. The assay is then terminated by the addition of formalin to the cells. The spread of the fluorescent dye through a population of cells is assessed with an epifluorescence microscope and the images are analyzed with any number of morphometric software packages that are available, including free software packages found on the public domain. This assay has also been adapted for in vivo studies using tissue slices from various organs from treated animals. Overall, the SL-DT assay can serve a broad range of in vitro pharmacological and toxicological needs, and can be potentially adapted for high throughput set-up systems with automated fluorescence microscopy imaging and analysis to elucidate more samples in a shorter time. The overall goal of this method is to provide a simple, comprehensive and relatively inexpensive technique to assess the potential toxicities of compounds. This is an in vitro approach that can be used in multiple cell lines. Standard cell biology labs equipped with epifluorescence microscopes can conduct research using this assay. Our basic knowledge of cell functions has been highly dependent on in vitro bioassays, and has become an essential component in toxicological assessments of pharmaceuticals, environmental pollutants, and food born contaminants. Unfortunately, there is no single in vitro bioassay system that can comprehensively meet the demands for all toxicological assessments. Many in vitro assays are designed and optimized to evaluate as well as assess a specific biochemical or molecular endpoint. These are quite often combined in a high throughput set up to reflect a perturbation of a certain signal transduction pathway, such as estrogen-receptor signaling1. This strategy has been quite successful, but the extensive number of signal transduction pathways involved in gene expression makes the task of choosing a specific signaling pathway to assess quite complex. High through-put protocols are currently being developed and used to simultaneously measure numerous signaling pathways, which has been one approach to overcome some of the limitations of single assays. However, not all signaling pathways have been successfully incorporated into more comprehensive approaches, plus new signaling pathways are constantly being discovered that further complicates this assessment process. Using extensive numbers of in vitro approaches, particularly high through-put systems, for comprehensive toxicological assessments are also very expensive and are not conducive to most single investigator led research projects. GJIC is a process tightly controlled by changes in voltage, calcium concentration, pH, redox balance, regulated by major intracellular signal transduction pathways and interactions with membrane and cytoskeleton proteins2,3. Thus, inhibition of GJIC can reflect different types of cellular stress, disruption of different cellular functions, or perturbations of different signal transduction pathways. Another approach to overcome the use of limited signal transduction bioassays is to take advantage of the biological phenomena that many, if not most, signal transduction pathways are further modulated by cooperative intercellular signaling systems through gap junction channels4-8. Although intercellular signaling systems are also numerous and under multiple pathway control, the intercellular signaling through gap junction channels is ultimately a function of the channels being opened, partially closed or completely closed. This provides an endpoint that can be easily measured using various in vitro bioassay systems7. Considering that the homeostatic set point of a tissue requires open channels, determining the effect of compounds on gap junctional intercellular communication (GJIC) is a more comprehensive approach in determining potential toxic effects of compounds4,8. In essence, this critical biological phenomenon that plays a central role in coordinating multiple signal transduction events controlling gene expression allows for a broad assessment of toxic effects. Thus, bioassays that assess GJIC are an excellent starting point to evaluate the toxic potential of compounds. The most extensive techniques used to assess GJIC are based on preloading cells with a fluorescent probe and then monitoring the migration of the dye from the loaded cell or cells to adjacent cells. Techniques to preload the dye have involved microinjection9, scrape loading10, and methyl esters of the probes11. The scalpel loading-fluorescent dye transfer (SL-DT) method is a modification of the scrape load - dye transfer assay developed by El Fouly10. 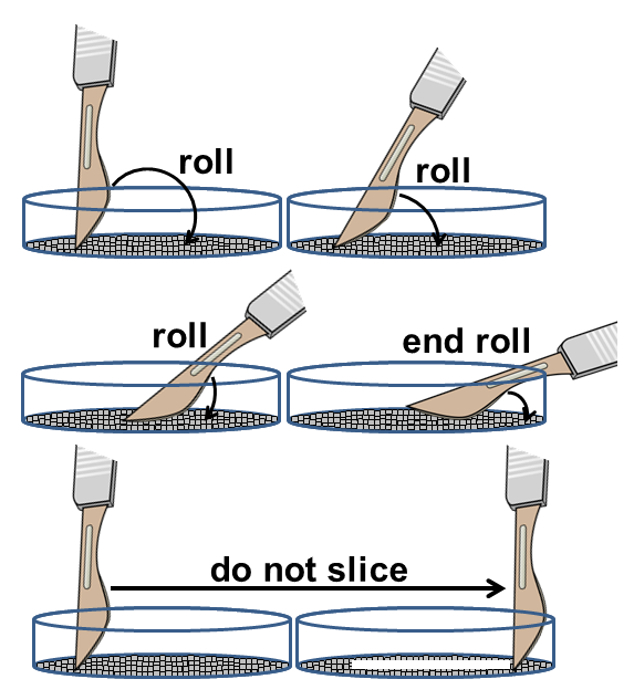 Rather than the more invasive scrape, the scalpel loading method of this report involves a gentle roll of a scalpel with a round blade through a monolayer of cells that minimize invasive damage (Figure 1). The advantages of this technique are the toxicological assessment of a population of cells rather than single cells of the microinjection assay. Furthermore, the simplicity of this assay allows for rapid detection of multiple plates in a short time whereas methods using microinjection techniques and techniques that use methyl esters of fluorescent probes are significantly more time consuming and require considerably higher skill level. Although there is no single method to meet all the needs of studying GJIC; the SL-DT assay is a simple, fairly inexpensive and versatile assay that can meet many of the needs for initial assessments of toxicities of various compounds. Major advantages include: simplicity, no special need for equipment or skills that are required for other methods such as microinjection, fluorescent recovery after photobleaching (FRAP) assay and local activation of molecular fluorescent probe assays, a rapid and simultaneous assessment of GJIC in a large number of cells, conducive to a high throughput set-up with automated fluorescence microscopy imaging and analysis, as well as its adaptability for in vivo studies. The protocol for this study was approved by the Animal Care and Utilization Committee of the National Institutes of Health Sciences of Japan, which is where the in vivo experiments were done, to assure that the rats were treated humanely and with regard for alleviation of suffering. Seed 3 x 105 WB-F344 rat liver epithelial cells onto 35 mm diameter culture plates containing Eagles modified medium plus 5% fetal bovine serum, and culture the cells in an incubator at 37 ºC, 100% relative humidity (RH), 5% CO2. Culture the cells until they reach 100% confluence (typically, 2 days) and conduct the desired experimental treatment of the cells as described below. Add 10 µl and 20 µl of a 2 mM stock solution of phenanthrene in 100 % acetonitrile and 4 µl, 6 µl, and 8 µl of a 20 mM stock solution of phenanthrene in 100 % acetonitrile to three plates of cells containing 2 ml of growth medium for each added volume of stock solution. Add 4 µl, 6 µl, 8 µl, 10 µl, and 20 µl of a 100% solution of acetonitrile to three plates of cells containing 2 ml of growth medium for each added volume of acetonitrile solution to serve as the vehicle control. Incubate plates for 15 min in an incubator set at 37 °C, 100% RH and 5% CO2. Add 7 µl of a 20 mM stock solution of phenanthrene in 100% acetonitrile to three plates of cells containing 2 ml of growth medium for each time point (i.e., 0, 1, 2, 3, 4, 5, 10 min). Add 7 µl of 100% acetonitrile to three plates of cells containing 2 ml of growth medium for each time point to serve as the vehicle control. Incubate plates for each designated time point in an incubator at 37 °C, 100% RH and 5% CO2. Add 7 µl of a 20 mM stock solution of phenanthrene in 100% acetonitrile to three plates of cells containing 2 ml of growth medium for 15 min. Add 7 µl of 100% acetonitrile to three plates of cells containing 2 ml of growth medium for 15 min to serve as the vehicle control. Decant the medium containing either the phenanthrene or acetonitrile and rinse 3x each with 3 ml of phosphate buffered saline (PBS). Add 2 ml of fresh growth medium to each plate and incubate for the desired recovery times (i.e., 25, 35, 45, 60, 90, 120, 150, 180, 240, 360 min) in an incubator at 37 °C, 100% RH and 5% CO2. Add the signal transduction inhibitor, i.e., 5 µl of a 20 mM stock solution of D609 in 100% acetonitrile to three plates of cells containing 2 ml of growth medium for 15 min. Add 5 µl of 100% acetonitrile to three plates of cells containing 2 ml of growth medium for 15 min to serve as the vehicle control. Add 7 µl of a 20 mM stock solution of phenanthrene in 100% acetonitrile to three plates of cells containing 2 ml of growth medium plus the D609 for an additional 15 min. Add 7 µl of 100% acetonitrile to three plates of cells containing 2 ml of growth medium plus the 100% acetonitrile for an additional 15 min to serve as the vehicle control. Discard the culture medium by either gently pouring off the medium or by vacuum suction. Note: Dispose culture medium containing hazardous waste appropriately. Rinse the cells three times each with 3 ml of PBS and either decant or aspirate between rinses. Pipette 1 ml of 1 mg/ml Lucifer Yellow dye dissolved in PBS (LY) into each cell plate. Preload the dye into the cells by gently rolling a #20 surgical steel blade with a rounded edge through a population of cells in three different areas of the plate. Begin by placing the scalpel perpendicular (90° angle) and 5 mm from the edge of the culture plate, and then roll the scalpel from this perpendicular angle to about an angle of 15° (see Figure 1). Note: This is achieved by pinching the scalpel between the index finger and thumb. Use gravity to allow the scalpel to gently go from the 90° to 15° position (as the rounded blade simply rolls over the cells). This motion will leave a visually noticeable indentation line. Incubate the cells with the LY solution for 3 min at room temperature. Decant or aspirate the LY and rinse three times with 3 ml of PBS to remove all extracellular dye to eliminate extracellular background fluorescence. Add 0.5 ml of 10% phosphate buffered formalin solution to fix the cells. Note: After fixing in formalin, air dry the cells and store in the dark for up to two years with minimum photobleaching of the LY dye. When required, rehydrate with 10% formalin solution to visualize the fluorescent dye front. View the fixed cells using an epifluorescence microscope equipped with a dichroic cube for excitation/emission peaks of 428/536 nm at a magnification of 200X. Align all plates so that the indentation line is parallel to the horizontal field of vision. Note: A FITC dichroic cube works well. Capture the image with a CCD camera and supporting software. Open the supporting software for the CCD camera and use the settings for auto exposure. Use the "capture" button to digitally acquire the image. Save the image as .tif files using the "Save" button. Remove approximately a 2 x 2 cm slice from the left lobe of a liver from a 5 week old, male Fischer 344 rat using dissection scissors and place it on a plastic weigh plate covered with wet gauze12. Pipette 0.5 ml of a PBS solution containing 1 mg/ml each of lucifer yellow and rhodamine-dextran (RD) onto the surface of the liver slice in the plastic weigh plate. Note: The RD is a dye that cannot traverse gap junction channels and will mark the cells that were loaded. Make three to five incisions approximately 1 cm long on the surface of the liver slice that has the dye solution in the weigh plate with a sharp blade and then add additional dye sufficient to fill the incisions. Incubate the tissue for 3 min at room temperature on the plastic weigh plate. Rinse three times with 5 ml of PBS. Fix the tissue overnight in 30 ml of 10% phosphate buffered formalin in a 50 ml conical centrifuge tube in the dark at room temperature. The following day, wash the slices with water, trim tissue around the incision with dissecting scissors into 1 x 1 x 0.5 cm3 strips and then use standard techniques to embed the slices in paraffin13. Section the slices perpendicular to the incision line to thickness of 5 µm and store the samples in the dark until ready to be imaged using standard sectioning techniques with a microtome13. Use an epifluorescence microscope equipped with a CCD digital camera to visualize and capture the images of the fluorescent dye fronts according to section 1.107. Measure the fluorescent dye spread using a morphometric software package (e.g., ImageJ). Click the "File" tab and then click "open" to open the saved image. Click on the "Free Hand Tool" in the Tool Bar Tab to trace the outline of the dye front. Click the "Analyze" tab and then click "Measure". Note: This will generate an area value in a spread sheet, which can be copied into other spread sheet programs if desired. Note: To determine the effect of the vehicle, Ae would be the area of the dye spread in cells treated by the vehicle and Ac would be the area of the dye spread in cells not treated by the vehicle. The effect of the vehicle should preferably be less than 10%. Interruption of GJIC has been extensively used as a biomarker for identifying toxic compounds at the nongenotoxic, epigenetic level of gene control that induces adverse health effects14. For example, polycyclic aromatic hydrocarbons (PAHs) are ubiquitous contaminants of the environment but vary in their epigenetic toxicities as a function of their molecular structures15. The lower molecular weight PAHs are typically found at relatively higher concentrations than the higher molecular weight PAHs in many diverse environments such as contaminated river sediments to that of cigarette smoke15,16. Phenanthrene is an example of a low molecular weight PAH that possess three benzene rings with an angular pocket called the bay region. 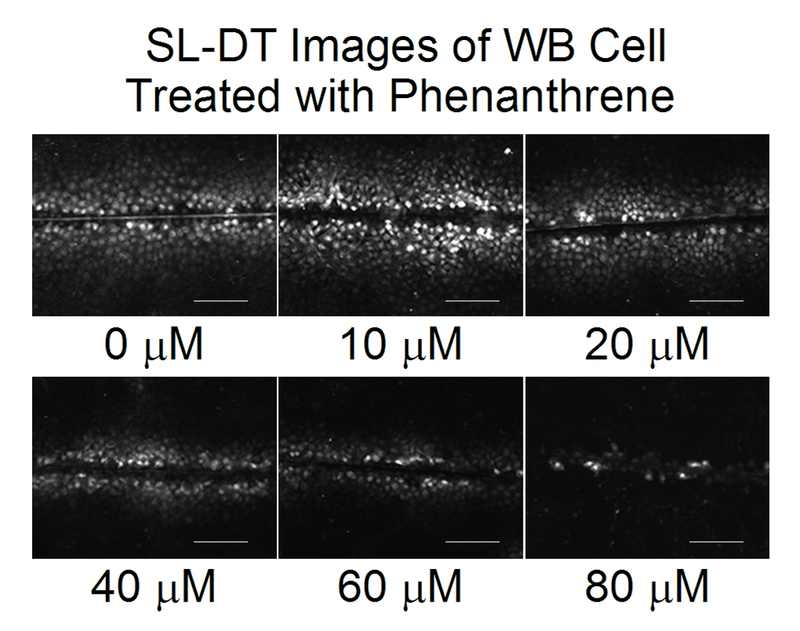 Figure 2 is a series of SL-DT images of WB-F344 rat liver epithelial cells treated with increasing doses of phenanthrene. Note the decrease in the migration of the fluorescent dye, Lucifer Yellow, with increasing doses. The areas of the scanned images can be determined as a fraction of the control (FOC). The control for Figure 2 are cells treated with the solvent that the PAH was dissolved in, namely acetonitrile. Typically SL-DT experiments are done in duplicate or triplicate for each trial with a minimum of three independent trials for each experimental parameter, which would be a dose in this experiment. The FOC values can then be averaged, statistically analyzed, and then graphed (see Figure 3). Similar experiments are also routinely conducted to establish the time for toxicant-induced inhibition of GJIC, and the time period needed to recover from this toxicant-induced inhibition of GJIC after the cells are transferred to toxicant-free medium. 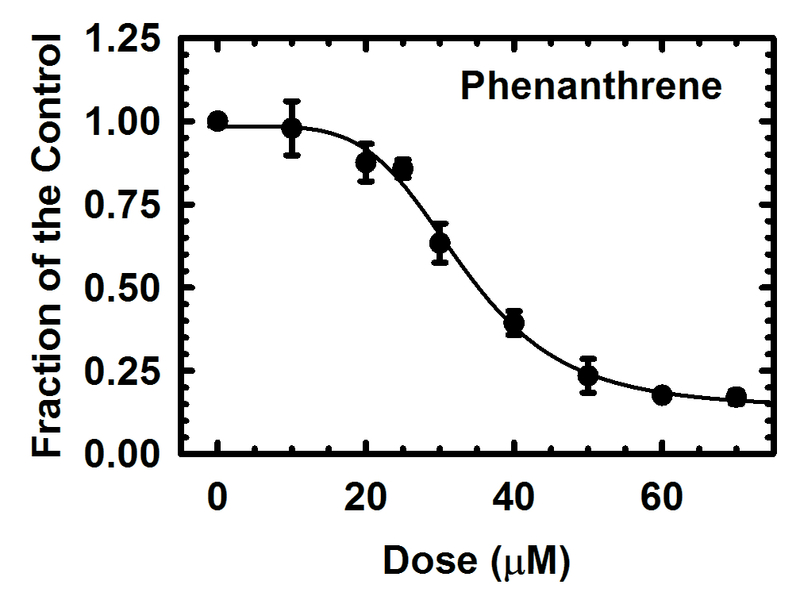 Figure 4 shows both the time response and recovery from inhibition by phenanthrene (Phe). The SL-DT assay can also be used to determine underlying mechanisms by which toxicant and toxins dysregulate GJIC4,16. This is done by pre-incubating cells with a pharmaceutical inhibitor of a selected signaling pathway before the addition of the toxicant or toxin that dysregulates GJIC. If the toxicant or toxin no longer dysregulates GJIC in the presence of a selected pharmaceutical that blocks a signaling pathway, then this pathway is determined to be a regulatory pathway of GJIC, while such pathways can be ruled out if the toxicant continues to dysregulate GJIC. Figure 5 demonstrates this principal in which 1-methylanthracene (1-MeA), another three ringed PAH that inhibits GJIC, but not in the presence of D609, which is a fairly specific inhibitor of phosphatidylcholine specific phospholipase C (PC-PLC). Thus, PC-PLC is ruled in as a candidate signaling enzyme involved in 1-MeA-induced inhibition of GJIC. The role of PC-PLC has been validated with further experimentation4,16. Overall, the SL-DT assays are quite conducive to begin the process of mapping signaling networks involved in the mechanisms of how toxicants and toxins inhibit (dysregulate) GJIC. This approach can also be used to screen for natural products that can block a toxicant or toxin from dysregulating GJIC. For example, resveratrol, an antioxidant found in high concentrations in red wine and peanut products can prevent 1-MeA from inhibiting GJIC (Figure 6). The SL-DT assay has been adapted to tissue slices from animals, particularly in the liver17. Perfluorooctanoic acid (PFOA) is an 8-carbon fluorinated fatty acid that is a persistent environmental pollutant known to induce liver cancers12,17. Using the SL-DT technique PFOA was shown to inhibit GJIC in an in vitro WB-F344rat liver model system18. An in vivo follow-up study determined that PFOA also inhibited GJIC in the livers of F344 rats treated with PFOA, thus validating the in vitro model system12,17. Figure 7 are fluorescent images from this follow-up experiment showing the dye spread in liver tissues of rats treated with the vehicle and PFOA. Figure 1: Cartoon image of the scalpel dye loading step. An illustration showing that the scalpel loading process involves rolling the blade rather than horizontally slicing through the cells as to minimize cell damage. Figure 2: Representative fluorescent microscopic images of the dye spread through gap junctions. WB-F344 rat liver epithelial cells were treated for 15 min with increasing doses of phenanthrene, a prevalent PAH found in the environment. Scale bar = 100 µm. Please click here to view a larger version of this figure. 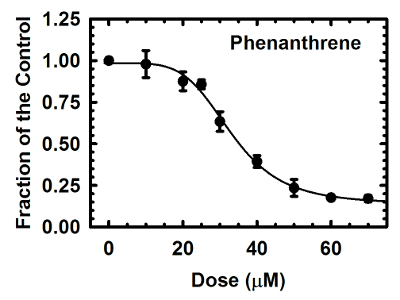 Figure 3: Dose response curve of phenanthrene-treated WB-F344 rat liver epithelial cells. Areas of SL-DT images were computed and then reported as a fraction of the control, which were cells treated with the vehicle (acetonitrile). Each data point is an average of three independent experiments and the error bars are the standard deviations at the 95% confidence limit for each dose after a 15 min exposure time. A four parameter logistic function was used to fit the line through the data points. Please click here to view a larger version of this figure. 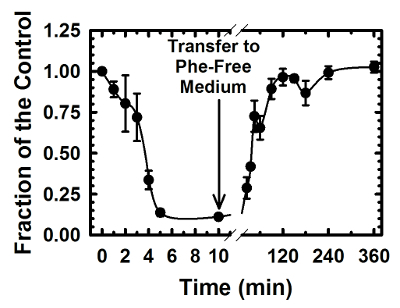 Figure 4: Time and time recovery response curve of phenanthrene-treated WB-F344 rat liver epithelial cells. 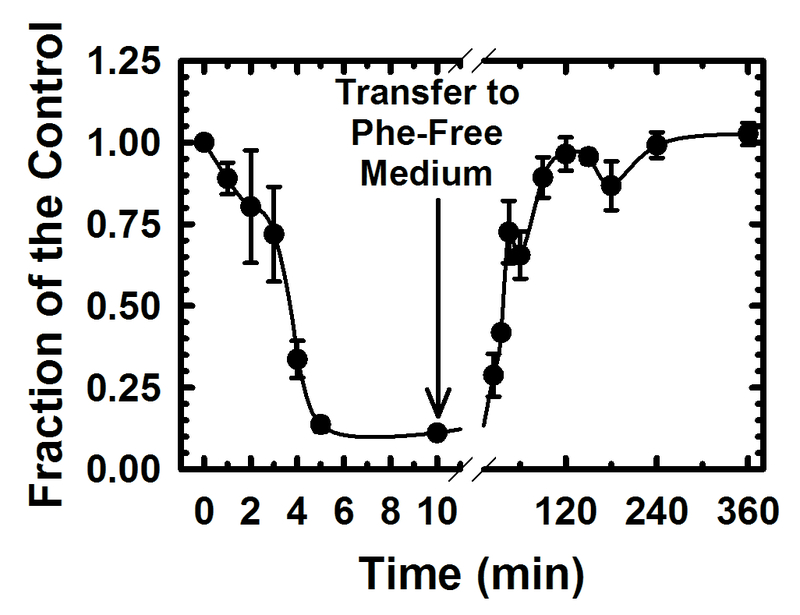 After complete inhibition of GJIC after 10 min of exposure, the medium containing phenanthrene (Phe) was switched to Phe-Free medium and then the cells were monitored for recovery from inhibition. Areas of SL-DT images were computed and then reported as a fraction of the control, which were cells treated with the vehicle (acetonitrile). Each data point is an average of three independent experiments and the error bars are the standard deviations at the 95% confidence limit. Please click here to view a larger version of this figure. Figure 5: Inhibition of GJIC by 1-methylanthracene is dependent on phosphatidylcholine specific phospholipase C. 1-methylanthracene (1-MeA) is a prevalent PAH found in the environment. The left panel represent cells treated with the vehicle (acetonitrile, 0.35% v/v). The middle panel represents WB-F344 rat liver epithelial cells treated for 15 min with 70 µM 1-MeA. 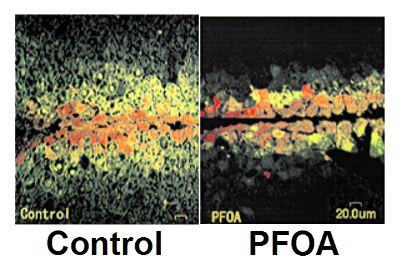 The right panel represent cells pretreated first for 20 min with 50 µM D609, a phosphatidylcholine specific phospholipase C inhibitor, followed by the addition of 70 µM 1-MeA for an additional 15 min. Scale bar = 100 µm. Please click here to view a larger version of this figure. Figure 6: Resveratrol prevented the inhibition of GJIC by 1-methylanthracene. The left panel represent cells treated with the vehicle (acetonitrile, 0.35% v/v). Resveratrol is an antioxidant found in red wine and peanut products. The middle panel represents cells treated for 15 min with 70 µM 1-MeA. The right panel represents cells first pretreated for 20 min with 50 µM resveratrol followed by the addition of 70 µM 1-MeA for an additional 15 min. Scale bar = 100 µm. Please click here to view a larger version of this figure. Figure 7: Ex vivo SL-DT assays of GJIC in liver slices from male F-344 rats. The left panel represents a slice of liver tissue from a rat treated with the vehicle control, dimethyl sulfoxide, for 24 hr. The right panel represents a slice of liver tissue from a rat after intraperitoneal administration of 100 mg/kg perfluorooctanoic acid (PFOA) after 24 hr. PFOA, a prevalent environmental contaminant, is a tumor promoting peroxisome proliferator that induces hepatomegaly and demonstrated to block gap junctions using an in vitro model. The incision loaded dye was done on liver slices from the vehicle and PFOA treated animals, which were then fixed, trimmed and sectioned. Reproduced from Environmental Health Perspectives12. Scale bar = 20 µm. Please click here to view a larger version of this figure. The SL-DT assay is a simple and versatile technique in measuring GJIC, but there are several critical concerns that should be accounted for in designing appropriate experimental protocols. For robust measurements of GJIC using the SL-DT assay there must be a good dye spread of the LY through gap junctions of the cells. At minimum, an adequate time should be selected to assure that the dye spreads through eight or more rows of cells from the scalpel loaded cells in both directions. Also, for the ease of measurement of the distance that the dye migrated from the scalpel loaded cells, select a magnification factor that assures the dye spread of the control plates fills 70 to 90% of the field of vision. For the WB-F344 rat liver epithelial cells, three minute incubation with the LY solution is sufficient for the dye front to move beyond four cell rows, and a magnification of 200X is optimum. Cells are grown on 35 mm diameter plates, which is quite amendable to loading the dye into the cells with a scalpel. However, cells can be grown in small wells, but the use of a scalpel is not possible, particularly in 96 well culture plates. For small wells, use a small round-tipped cutting edge that can fit into the well, and again, use a rolling action. This rolling action is a critical step as it is minimally invasive and provides a very clean line of loading that prevents the cells from being torn and creating a large cell-free gap typical of the original scraping method. Alternatively, an acupuncture needle can be used in which a small twist of the needle does a nice job of loading dye into the cells. Other cell-types can be used in this assay. However, selection of cells and understanding the roles of GJIC in a particular cell type is important in framing appropriate hypotheses and the design of the experiments. The first and most obvious step is to develop cell culture conditions in which functional gap junctions are expressed. In well-differentiated cell types, which perform specific metabolic functions, gap junctions typically play a role in coordinating metabolic pathways between contiguous cells. Well-differentiated cell types have limited, if any, proliferative capacities and the channels probably play a tissue specific metabolic role that often depends on morphology and specific arrangement of cells. For example, cardiac myocytes are elongated cells where gap junctions are predominantly aligned at the intercalated discs, thus using the SL-DT method would require aligning the cells, which can be done in a grooved dish. Thus, careful considerations must be made for each cell type. Studies with neuronal cell cultures typically are not confluent and also require specific contact points, which makes the use of the SL-DT inappropriate and alternative GJIC assays must be used. In proliferative cell types, such as stem and early progenitor cells, GJIC plays a more critical role in coordinating cell signaling events that control gene expression regulating mitogenic events. The WB-F344 rat liver epithelial cells used in this protocol falls into this category. Gap junction genes are critical during tissue development and maintenance19-21. Although gap junction channels are expressed and formed on all cell plasma membrane surfaces, proliferative cells are very sensitive to growth factors, which inhibit GJIC. Critical considerations for proliferative cell-types are usually oriented more to the composition of the media. Growth factors are often in excess, particularly in undefined medium containing fetal bovine serum, and the cells' gap junctions may be in a closed state. The easiest way to establish GJIC in these cells is to reduce or remove the serum levels for 4 to 24 hr before experimentation, although 24 hr would be too long for cells with no serum as they would apoptose. The WB-F344 liver epithelial cells used for the experiments presented in this paper are not overly sensitive to serum with no need to reduce serum levels. In contrast, experiments using a C10 mouse cell line must be first serum deprived to establish GJIC22. Although serum levels vary between the two cell types, interestingly, the C-10 cells responded very similarly to methyl isomers of anthracene22,23. Other considerations for quality results include conducting the experiments at non-cytotoxic doses. Cells need to be checked with phase contrast microscopy to determine healthy morphological features expected of the cell type before and after treatment. To assure that the effects of a compound on gap junction function is not due to a general cytotoxic response, cytotoxicity assays for each compound should be done at the same time and dose used in the SL-DT assay. Conducting experiments to determine if an inhibitory effect of a compound on GJIC is reversible is also a good experiment for at least two reasons. Most compounds tested reversibly inhibit GJIC, but if there is no recovery of GJIC, then cytotoxicity might be a factor and further testing would be required. However, if GJIC is restored then the dose and time tested were probably not cytotoxic. There are biological implications for the reversible inhibition of GJIC. The adverse health effects of many environmental and food borne toxicants and toxins is a reversible process. Therefore understanding this reversibility at the molecular level is important. If an unknown compound does not reversibly inhibit GJIC, then the implications for the health of an organism could be quite different from most other agents and needs to be part of the risk calculations. Determining the dose and time involved in the inhibition of GJIC is an iterative process. To save time and money for the culture supplies, the best approach is to begin at a high dose, which depends on solubility and time (typically an hour, as most inhibition occurs in less than 15 min), and then reduce the time and dose by half in a step wise process until there is no effect. If there is no inhibition at a high dose at one hour, then double the time period in a step wise process. 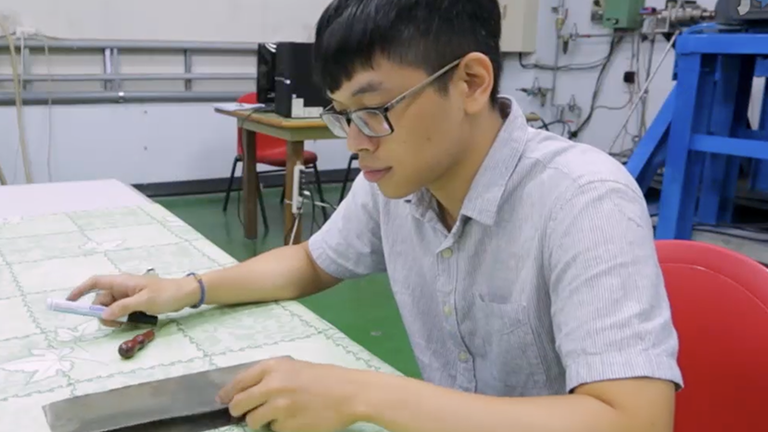 Initial experiments can be done on a single plate. Once the general time estimates and doses are established, then more thorough studies can be efficiently designed with appropriate sample sizes for statistical analyses. One experimental design feature would be to use the dose and time that reach 75 to 100% inhibition. Obviously, the final interpretations of results will be a factor of the above parameters. However, by first determining a biological effect, even if the dose and time may not be relevant in vivo, the established doses can play a role in situations of occupational exposures, or to general populations exposed to other factors that also affect GJIC with potential additive or synergistic effects. The inhibition of GJIC by most compounds typically is not highly variable and two to three replicates (each replicate would be a culture plate or well) is sufficient to generate dose and time response curves. However, if variability is high then more replicates would be needed to get an accurate value for a given dependent variable of one independent trial. Of course, at least three independent trials need to be done for statistical analyses. The simplicity of this assay and the assessment of significant cell population sizes is an advantage for many applications. This is particularly useful in many toxicological assessments. However, there are limitations of the SL-DT assays, which can depend on several factors. One is whether this technique is appropriate to the cells being studied. This assay would not work well for cells that do not reach high confluency with sporadic contacts throughout the culture plate or well. Alternative techniques, such as microinjection should be considered. Alternatively, the SL-DT assay can be modified. Success in loading single cells has been achieved with an acupuncture needle, which requires a slight twisting action when loading the dye7. The spread of dye would be radial in more confluent situations or amorphous through cell culture with sporadic cell contacts. The addition of Rhodamine dextran (RD, 1 mg/ml) to the LY dye solution is recommended for experiments where identifying the loaded cells would be difficult without a marker (such as RD). RD is too large to traverse gap junction channels, thus identifying which cells were loaded. RD can also be used in all SL-DT assay, but the scalpel leaves an indentation on the bottom of the dish identifying where cells are loaded. The SL-DT assay is also not conducive to measuring changes in GJIC between different types of cell as the dye loading would not discriminate between cell types. Again microinjection is the method of choice, but the acupuncture needle method might also work if one can target a specific cell using a microscope. The metabolic cooperation assay is another method to measure GJIC. This method was one of the first standardized bioassay for GJIC24. In this assay, wild-type Chinese hamster V79 cells (6-thioguanine-sensitive) and 6-thioguanine-resistant cells were co-cultured at high densities in which 6-thioguanine (6-TG) resistant cells do not metabolize 6-TG to a toxic metabolite, thus conferring resistance. Co-culture with the 6-TG sensitive cells results in the transfer of the toxic metabolite through gap junctions resulting in cell death where inhibition of GJIC results in the rescue of 6-TG resistant cells by preventing the transfer of the toxic 6-TG metabolite from the 6-TG sensitive cells. Although an advantage of this assay is that it is minimally invasive, a major disadvantage is that it requires one week for completion, which makes extensive dose and time dependent assessments of toxicants as well as mechanistic studies, etc. impractical for assessing many chemicals. The SL-DT assay is not conducive to mechanistic studies that need to trace the migration of dyes through different cell types, in which microinjection is the preferred method. Alternatively, cells can be preloaded with the methyl ester of fluorescent dyes. The loading of the dye is a function of intracellular methyl esterases that hydrolyze the lipophilic dye into its more hydrophilic form, thus trapping the dye in the cells. This is a less invasive way to preload the fluorescent probe, but the most common way to measure intercellular communication where all cells are preloaded by this method is the FRAP assay11. The advantage of FRAP is again the ability to assess gap junctions in single cells, which is excellent for mechanistic studies. However the disadvantage of FRAP lies in: the inability to measure populations of cells for toxicological assessments, the need for sophisticated and very expensive microscopes/laser cytometers, the need for highly skilled technical expertise, is moderately invasive from the free radicals produced by the laser, and not conducive to high throughput. More recently another technique has been developed; the local activation of molecular fluorescent probe (LAMP) method25, which is based upon a new generation of caged coumarin-like fluorophores. Similar to the FRAP assay, all cells are preloaded with dyes containing a methyl ester, however, these dyes become fluorescent upon subsequent localized illumination by lasers with a small dose of ultraviolet light, which probably produces significantly lower ROS than FRAP. Again, this assay has the same limitations of the FRAP assay. Other recent advancements for measuring GJIC are the preloading and parachute techniques, which also involve the use of methyl ester-fluorescent dyes. The preloading technique involves suspending the cells preloaded with fluorescent probe together with the unloaded counterparts and are then plated and allowed to form a confluent monolayer. The spread of the dye can then be observed with an epifluorescence microscope26. In the parachute assay, the cells preloaded with the fluorescent probe are overlaid onto a monolayer of unloaded cells, and the spread of the dye is observed with an epifluorescence microscope27. Again, the above techniques are technically more challenging for high throughput analyses, and must be immediately plated at near confluence and requires a time lag for the reattachment of cells. Overall, the SL-DT assay is a relatively inexpensive, simple and versatile technique that uses equipment, such as CO2 cell culture incubators, biosafety cabinets and epifluorescence microscope, typically found in most cell culture labs. With minimal experience many plates can be processed in a day, which is conducive for screening compounds for toxicity as well as for natural products that prevent or reverse the effects of toxicants and toxins. Also, adapting this assay for high throughput analyses using robotics, with automated fluorescence microscopy imaging and analysis systems will have the potential to screen large numbers of toxicants and toxins. Supported by NIEHS grants #R01 ES013268-01A2, and the contents are solely the responsibility of the author and do not necessarily represent the official views of the NIEHS, and supported by CETOCOEN UPgrade project No. CZ.1.05/2.1.00/19.0382. imaging system Nikon -Mager Scientific Nikon NIS-Elements F2.2 imaging system. Rotroff, D. M., et al. Predictive endocrine testing in the 21st century using in vitro assays of estrogen receptor signaling responses. Environ.Sci.Technol. 48, (15), 8706-8716 (2014). Axelsen, L. N., Calloe, K., Holstein-Rathlou, N. H., Nielsen, M. S. Managing the complexity of communication: regulation of gap junctions by post-translational modification. Front Pharmacol. 4, 130 (2013). Nielsen, M. S., et al. Gap junctions. Compr.Physiol. 2, (3), 1981-2035 (2012). Sovadinova, I., et al. Phosphatidylcholine specific PLC-induced dysregulation of gap junctions, a robust cellular response to environmental toxicants, and prevention by resveratrol in a rat liver cell model. PLoS.One. 10, (5), e0124454 (2015). Trosko, J. E., Chang, C. C. Biologically Based Methods for Cancer Risk Assessment. Travis, C. C. Plenum Press. New York. 165-179 (1989). Trosko, J. E. Biomarkers and occupational health: progess and perspectives. Mendelsohn, M. D., Peeters, J. P., Normandy, M. J. John Henry Press. Washington D.C. 264-274 (1995). Upham, B. L. Role of integrative signaling through gap junctions in toxicology. Curr.Protoc.Toxicol. 47, 2.18:2.18.1-2.18:2.18.18 (2011). Vinken, M., et al. Connexins and their channels in cell growth and cell death. Cell.Signal. 18, (5), 592-600 (2006). Browne, C. L., Wiley, H. S., Dumont, J. N. Oocyte-follicle cell gap junctions in Xenopus laevis and the effects of gonadotropin on their permeability. Science. 203, (4376), 182-183 (1979). El-Fouly, M. H., Trosko, J. E., Chang, C. C. Scrape-loading and dye transfer. A rapid and simple technique to study gap junctional intercellular communication. Exp.Cell Res. 168, (2), 422-430 (1987). Wade, M. H., Trosko, J. E., Schindler, M. A fluorescence photobleaching assay of gap junction-mediated communication between human cells. Science. 232, (4749), 525-528 (1986). Upham, B. L., et al. Structure-activity-dependent regulation of cell communication by perfluorinated fatty acids using in vivo and in vitro model systems. Environ. Health Perspect. 117, (4), 545-551 (2009). Paraffin Processing of Tissue. Protoplasma. http://protocolsonline.com/histology/sample-preparation/paraffin-processing-of-tissue (2012). Trosko, J. E. Gap junctional intercellular communication as a biological "Rosetta stone" in understanding, in a systems biological manner, stem cell behavior, mechanisms of epigenetic toxicology, chemoprevention and chemotherapy. J. Membr. Biol. 218, (1-3), 93-100 (2007). Upham, B. L., Weis, L. M., Trosko, J. E. Modulated gap junctional intercellular communication as a biomarker of PAH epigenetic toxicity: structure-function relationship. Environ.Health Perspect. 106, 975-981 (1998). Upham, B. L., et al. Tumor promoting properties of a cigarette smoke prevalent polycyclic aromatic hydrocarbon as indicated by the inhibition of gap junctional intercellular communication via phosphatidylcholine-specific phospholipase. C. Cancer Sci. 99, (4), 696-705 (2008). Sai, K., Kanno, J., Hasegawa, R., Trosko, J. E., Inoue, T. Prevention of the down-regulation of gap junctional intercellular communication by green tea in the liver of mice fed pentachlorophenol. Carcinogenesis. 21, (9), 1671-1676 (2000). Upham, B. L., Deocampo, N. D., Wurl, B., Trosko, J. E. Inhibition of gap junctional intercellular communication by perfluorinated fatty acids is dependent on the chain length of the fluorinated tail. Int. J. Cancer. 78, (4), 491-495 (1998). Trosko, J. E., Tai, M. H. Infections and inflammation: Impacts on oncogenesis. Impacts on Oncogenesis. Contrib Microbiol. Dittmar, T., Zaenkar, K. S., Schmidt, A. Karger. Basel. 45-65 (2006). Trosko, J. E. Human stem cells as targets for the aging and diseases of aging processes. Med. Hypotheses. 60, (3), 439-447 (2003). JE, T. rosko Stem Cells and Cancer. Dittmar, T., Zaenkar, K. Nova Publishers. New York. 147-188 (2008). Osgood, R. S., et al. Polycyclic aromatic hydrocarbon-induced signaling events relevant to inflammation and tumorigenesis in lung cells are dependent on molecular structure. PLoS. One. 8, (6), e65150 (2014). Weis, L. M., Rummel, A. M., Masten, S. J., Trosko, J. E., Upham, B. L. Bay or baylike regions of polycyclic aromatic hydrocarbons were potent inhibitors of gap junctional intercellular communication. Environ.Health Perspect. 106, (1), 17-22 (1998). Yotti, L. P., Chang, C. C., Trosko, J. E. Elimination of metabolic cooperation in Chinese hamster cells by a tumor promoter. Science. 206, (4422), 1089-1091 (1979). Zhao, Y., et al. New caged coumarin fluorophores with extraordinary uncaging cross sections suitable for biological imaging applications. J. Am. Chem. Soc. 126, (14), 4653-4663 (2004). Goldberg, G. S., Bechberger, J. F., Naus, C. C. A pre-loading method of evaluating gap junctional communication by fluorescent dye transfer. Biotechniques. 18, (3), 490-497 (1995). Ziambaras, K., Lecanda, F., Steinberg, T. H., Civitelli, R. Cyclic stretch enhances gap junctional communication between osteoblastic cells. J.Bone Miner.Res. 13, (2), 218-228 (1998).